In upcoming years the world will see the development of numerous planned cities and urban renewal projects, most costing in the ballpark of billions of dollars. The following is a list of the most expensive planned projects which make the most expensive houses look cheap in comparison. Law 6306 announced by Ministry of Environment and City Planning in Turkey ensures that urban renewals are being conducted all over Turkey (but mainly in Istanbul). A neighbourhood of Kadikoy called Fikirtepe has been identified as the pilot area for the project. Construction began in 2012 and is expected to take 20 years. The project was set in motion after two earthquakes in 2011 in the eastern province of Van. Approximately seven billion buildings cited as earthquake hazards will be demolished and reconstructed. The Urban Renewal is called The Khazar Islands and will be a man made archipelago which will consist of 41 islands sizing 3,000 hectares over the Capsian Sea. Its expected date of completion is 2020-2025. The Islands housing capacity is one million and will include 150 schools, 50 hospitals and day-care centres and the anticipated tallest building in the world Azerbaijin Tower. All urban renewal construction buildings in the Islands are designed to withstand up to a magnitude of 9.0 earthquakes. Currently on-hold owing to the lingering effects of the Global Financial Crisis, Dubai International City is a urban renewal with "Dubai-themed" architecture consisting of housing, business and tourist attractions. 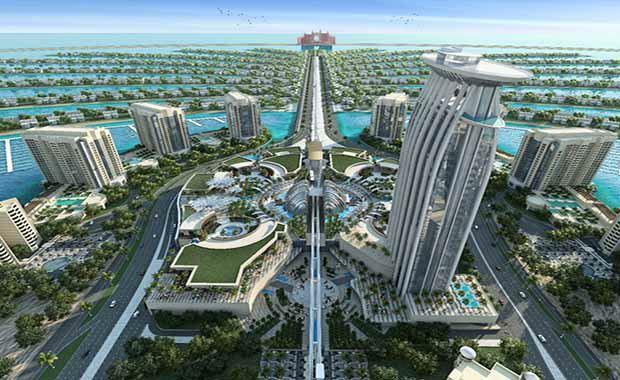 The new planned city spreads over 800 hectares and can house over 12,000 residents. There will be residential districts within the planned city which cater to specific countries such as Persia, France, England, Russia and China. The planned city Central District will consist of The Forbidden City, The Lake District and Dragon Mart. Dubai makes the list again with another planned city urban renewal called Jumeriah Garden City which is on hold owing to the global financial crisis. It will consist of 12 districts and will house between 50,000 to 60,000 residents. The project will take 12 years and will offer houses of a higher end price. The project has been designed to exemplify high standards of sustainability, and is anticipated to be a ‘revolutionary example’ to the world. The Madinat al-Hareer (translated meaning is City of Silk) is an upcoming urban area in Kuwait. It will include the Burj Makarak al-Kabir which is a nature reservation, tourist attractions, a large business centre, environmental areas, areas focusing on health and education, and conference areas. The urban renewal project begun undergoing development in 2014 and will take 25 years to complete. A skyscraper at a height of 1,001 metres will be built in reference One Thousand and One Arabian Nights. The Delhi Mumbai Industrial Corridor is an upcoming State-Sponsored Industrial Urban Renewal Development Project. Instead of one planned city, it will endeavour to span across six states in order to prompt economic development and develop industries. India must employ in excess of 100 million people in the next 10 years which will be helped by the construction of the Industrial Corridor. Both India and Japan have agreed to set up a project development fund with the initial contribution being 10 billion with both countries governments contributing equally. The King Abdullah Economic City will be an hour away from all capital Middle Eastern cities via plane. It will also be in driving distance from Mecca and Medina. The completion date is 2020 and will bring in foreign and domestic investments by diversifying the kingdom’s oil-based economy. Up to 1 million jobs will be available for young citizens with 40 per cent of residents under 15. Making the list for a third time is Dubai with Dubailand. Dubailand is an entertainment complex expected to open before 2020. The complex will be divided into six zones including Entertainment World and Sports and Outdoor World. The planned city will be twice the size of Walt Disney World Resort and the world’s largest collection of theme parks. The Songdo International Business District is an upcoming Smart City built from scratch. It will include the Northeast Asia Trade Tower and the Incheon Tower. The new planned city with also have hospitals, schools and apartments available. There will be replicas of famous landmarks such as Venice’s waterways and Central Park in New York City. The Urban Renewal is expected to be completed in 2015. Yas Island is an urban renewal project constructed on an island which can be accessed via car, plane, boat or sea. It will be a multi-purpose leisure centre expected to be completed in 2018 with a possibility of additional features being added. The island is popular amongst business and holiday travellers. There is a daily shuttle service which offers three pickups in the morning and afternoon. SEE ALSO: Are Man-Made Beaches The New Trend In Apartment Living?